Arsene Wenger has always been wonderfully inventive with who he casts in the role of Arsenal’s defensive midfielder, and sure enough Francis Coquelin’s pathway to the side has been no less remarkable. We know the story by now: on another non-descript loan in his fifth year at the club, Coquelin was recalled amidst an injury crisis in midfield. He wasn’t expecting to play because things don’t just happen like that, but little did he know that Wenger had birds watching every pass, tackle and mistake that he made, and each favourable/unfavorable report sent back to headquarters served to shape his very future. Luck had played his part too, but when everything down to the last detail concerns a man like Wenger, luck will eventually favour you. A place had opened up in the side for Coquelin because of injuries – and also because, as Martin Keown revealed during Arsenal’s 2-0 FA Cup win over Hull City, Wenger was looking for someone that could provide the snarl and aggression that Mathieu Flamini did, but more crucially, play more proactively, pushing the team up the pitch. Coquelin did this, reinvigorating the side through the way he did things simply: winning the ball back and passing it quickly. At the same time, other pieces began to align: Mesut Ozil returned from injury back to his favoured position, Olivier Giroud came back like a dog unleashed, and Arsene Wenger could chose from a settled squad. These things all come together to explain Arsenal’s unbeaten run which began in February and ended at the start of the week, against Swansea. What it showed that finding attacking chemistry takes time and continuing on the Coquelin theme, as does somebody who bends to the will of the side. As Tim Stillman writes for Arseblog, “for Wenger, the defensive midfielder is usually the last piece of his puzzle.” Yet, as we found out in the 1-0 defeat to Swansea, Coquelin is still some way from the perfect fit. 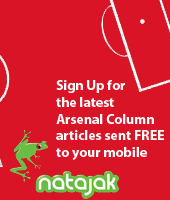 He’s as good as Arsenal have got – a halfway house between Mikel Arteta and Flamini – though to be truly “The Answer”, he needs to add more subtlety to his game. In that game, Coquelin was constantly found wanting as the outlet in possession at the back. In fact, he’s the exact opposite: a decoy when Arsenal have the ball in defence, looking to shuffle opponent midfielders this way and that to open up space for the centre-backs to pass through. Indeed, after the 3-1 win over Hull City, Wenger praised the way Laurent Koscielny and Per Mertesacker stayed composed with the ball at the back, patiently waiting for an opening to develop. Coquelin by contrast, rarely took responsibility for this and in an opening 35 minutes, when Arsenal assumed a two-goal lead, he only made 9 passes. Against Swansea he was more involved yet hardly the pivot that you need when defences are set. Wenger, though, is inventive in that regard when details his midfielders to push up the pitch, to force the opponents back so that Arsenal can play as much as possible in their half. I expand on this tactic in my most recent Arseblog column. In that game, he also asked Ozil and Santi Cazorla, in addition to Ramsey, to drop deeper for the ball and use their 1v1 ability to get into space or play the pass through. 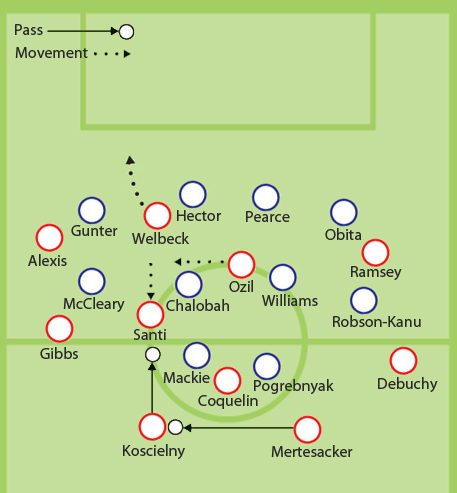 It will be interesting to see how this tactic will develop; whether it was the players who initiated this move by being drawn to the ball or Wenger is trying to draw the opponent’s backline out simultaneously – a la PSG – to play the ball over the top (thus the recent recasting of Theo Walcott up front).